Today I’m excited to welcome Christopher Bunn to the blog as part of the LUMINOUS Blog Hop and Giveaway. Christopher will be chatting with us about writing noblebright fantasy (including what the heck that is), his own contribution to LUMINOUS, and his favorite re-reads. To wrap it all up, we have an awesome giveaway of a “Not All Those Who Wander…” LOTR tote bag + an “I Solemnly Swear I Am Up To No Good” Harry Potter Journal at the end of the post, plus author swag! So make sure to scroll all the way down. Here we go! Hi Christopher! To start us off, what is Noblebright to you? I think I was writing in the Noblebright genre long before I’d ever heard the term. For me, life has to have an ultimate meaning, a hopeful meaning; something bigger and deeper, something beyond humans, outside of our existence and outside of our control. I’ve taken that hope and written it into my stories. I’m not saying my books are all sweetness and unicorns and little fairies wearing bluebells on their heads. On the contrary, light and hope shine all the brighter in the darkness, and there’s plenty of shadow in my books. How do you portray the Noblebright ideals in your work in general and the Luminous selection in particular? 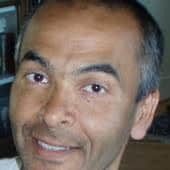 I write in three genres: fantasy, science fiction and humor. My humor is rather odd and mostly written, I suspect, as a therapy (much cheaper than paying a psychologist). However, in both fantasy and science fiction, the Noblebright ideals are vital to how I create my heroes. They don’t always make the right choices, but, when the story’s over and done, they’ve always chosen hope, even if it results in loss and pain. That’s a choice that’s always before all of us, even in our everyday lives, and it’s something I want my readers to recognise when they read my stories. If I can create a character that feels familiar to a reader, despite the fantastic trappings of magic and dragons and strange monsters, if they can journey along with that character through a book and start thinking, “Hmm, I hope he makes the right choice–I hope I would make the right choice if I was inside this book,” then hopefully I’m encouraging my readers. That’s what a lot of great stories are about, isn’t it? Leaving readers with a sense that life can work out, even in the darkest times. Charles Dickens wrote some masterful stories with that thread running through them. One of the best, in my humble opinion, is Tale of Two Cities. Despite the story ending sadly for Sidney Carton, he made a fantastic choice, laying his life down for someone else, and even though he went to the guillotine, his death, oddly enough, leaves you with the sense that here was a man who died well, who died nobly, whose death was full of hope. My story in the Luminous collection is The Hawk and His Boy. The main character, Jute, is just a rough, young street thief. He doesn’t always make the right choices, but, as the story progresses, he slowly becomes aware of a world much bigger than what he knew and believed. Ultimately, he learns that there’s much more to life than simply living for himself. That’s a lesson we all need to learn and relearn, every day. I know I certainly do! That’s definitely a lesson to live by! 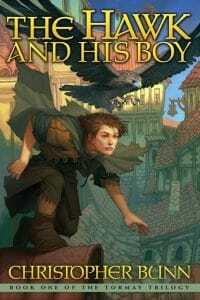 Do you have plans for a sequel to The Hawk and His Boy? I actually have two more books already written that take place after The Hawk and His Boy: The Shadow at the Gate and The Wicked Day. The three books together pretty much round out the story of Jute. However, I included so many side characters and reference to the history of the world I created that I suppose I could write an easy dozen more books in that world without exhausting its possibility. However, given that there are only twenty-four hours in the day and that I haven’t figured out how to live without a certain amount of sleep, I’m not sure when those stories will be written. Finding time to write is definitely challenge. Speaking of which, how do you like to write? Longhand (shorthand? ), typewriter, computer, blood, nail scratches on the walls? These days, I write on computer. It’s a strange thing. Even though I love to write and love to create stories, I do it with a great deal of tooth-grinding and irritation. How can something you love so much drive you so crazy? Perhaps love is always like that (see: Marriage and Family). At any rate, I write a like a snail who sets records for Slowest Snail in the Entire Kingdom of Snails. Any sort of distraction will get me, such as paint drying on the wall, the suspicion of something tasty (or even just edible) in the refrigerator, or chores. Chores, for crying out loud! I’d rather do chores than write. Yet, I love writing. That goes to show you that, yes, writers are certifiably insane. Ha! I can empathize with the love-hate relationship between an author and their writing. Given how difficult writing is, what is your perfect writing day? My perfect writing day is dark, rainy weather. An empty house (hopefully with the rest of my family visiting relatives on another continent). A satisfying selection of snacks and drinks in the pantry and refrigerator. Absolutely no one calling me on the phone, and the wind sighing in the eaves as the rain patters on the roof. That sounds pretty awesome! I also love reading on a rainy day. So … what’s your favorite re-read book for a rainy afternoon? What a perfect combination: rain and a great book. I find, as I grow older, that books really are the best way to relax. A good book is infinitely preferable to an excellent movie (movies merely give you a two hour or so window into another world; books actually plunge you into other worlds). I don’t have one favourite book to re-read, but I do have a list of them: Chesterton’s Father Brown stories, Ellis Peters’ The House of Green Turf, Fitzroy MacLean’s Eastern Approaches (one of the best autobiographies I’ve ever read), Robert Lewis Taylor’s A Journey to Matecumbe (do NOT see the Disney film–beyond dreadful), The Lord of the Rings, Lewis’ That Hideous Strength, and any number of children’s chapter books. I have to say, there are some brilliant chapter books for kids that stand a great many reads: Gardner’s The Giant in the Snow, Alexander’s The Prydain Chronicles, many of Daniel Pinkwater’s books, most of Sid Fleischman’s books (especially The Great Hornspoon, Ghost in the Noonday Sun, Chancy and the Grand Rascal, etc). Books… they’re better than food. Thanks so much for the interview, Christopher! Discover Christopher Bunn’s writing, and nine more noblebright reads in Luminous… You can also check out the full line-up of Luminous author interviews at http://noblebright.org. Now, ten fantasy authors have come together to offer this epic boxed set of noblebright fantasy! Don’t miss this fantastic opportunity to explore ten unique worlds, fall in love with gallant heroes and heroines, and discover the chinks in the darkness where the light shines through. Wow! Sounds like a great collection of stories. Really enjoyed the interview – I had never heard of the noblebright genre before! Yay! So glad you enjoyed the interview. Noblebright is a relatively new name for an old genre–I think the term has gained traction in response to the upsurge in grimdark fantasy. But if you look at some of our oldest fantasy, they qualify as noblebright pretty easily–Lord of The Rings, for example, or the Narnia books. I just never had a word for them until this past year! My favorite Noblebright character is probably Kel from Tamora Pierce’s Protector of the Small. There is just something about how she never stops trying to do the right thing that makes me admire her so much. Yes! Kel is awesome like that. I love having characters whom I can respect and admire. I find with more typical “grimdark” characters, I often lose my respect for the character somewhere along the way. It’s not a feeling a like. It’s so hard to choose, isn’t it? Thanks so much for stopping by! Favorite character? Rachel Griffin—and Rachel and the Many-Splendored Dreamland was a great read. I approve of this plan! 😉 Thanks so much for stopping by. I hope you find many such favorites in the future! 😉 Thanks for stopping by. No favorite yet, but I look forward to meeting them all between the pages! I’d love all this stuff! 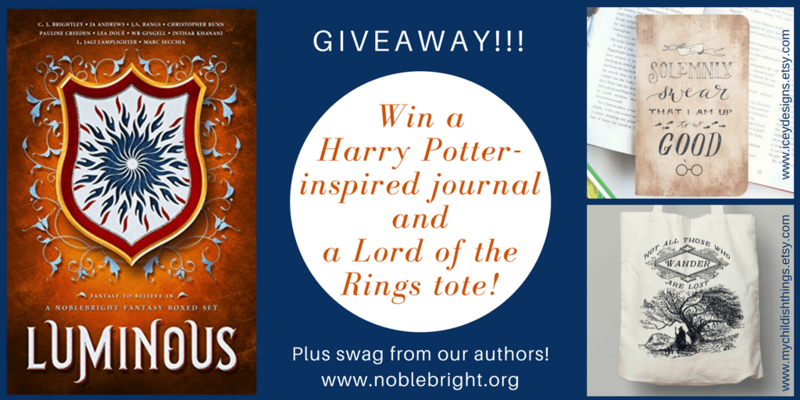 It’s totally fitting to have a Tolkien giveaway…noble bright goes back to the greats! I don’t know if I have a favorite (It really is difficult to pick a favorite when it comes to books, isn’t it?) as Noblebright isn’t really something I have heard of before, but it has definitely piqued my interest. Picking favorites is definitely tough. That’s a pretty evil question, I must admit. 😉 So glad you’ve found noblebright intriguing–I think it’s been around for a looong time, but it just hasn’t had a term for itself till now. I definitely think both Harry Potter and Lord of the Rings fall into the noblebright “camp.” Thanks so much for stopping by! I do not have a favorite ATM, hoping to change that! Wishing you many awesome (and noblebright!) reads in the future! Yay! Thanks so much for reading, and for stopping by! I have seen the anthology and it is still on my wishlist, although I do have Sunbolt (though still on my to-read list). Looking back, I would say that most books I read fall under the Noblebright definition, so I’m definitely interested to follow along and get the box set(s). The Lord of the Rings books are my favorite books that would fit this definition! I reread the series every couple of years! LOTR is amazing, isn’t it? And yes, I agree–looking back at the books I’ve loved over my life, they’re almost exclusively noblebright (even when they aren’t fantasy!). Go figure. 😉 I hope you enjoy Sunbolt when you get to it! Thank you! 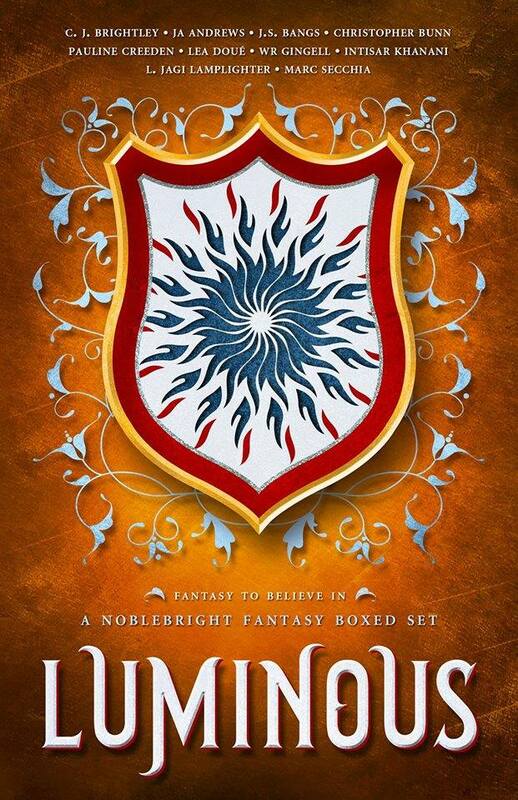 I’m so thrilled that Sunbolt sounds intriguing to you! If you have a chance to pick it up, I’d love to hear what you think of it. I have such a hard time picking favorites, especially for noblebright, because it’s kind of my favorite genre, and in a way, what I look for in a novel! So… I guess all of the ones I read are my favorite, and I’m still getting more! Best. Answer. Ever. ???? Like you, I’ve found I mostly prefer noblebright stories, and then … picking a favorite? That’s a hard thing. I don’t think I could do it.